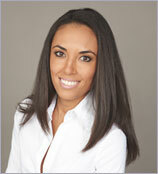 Nicole Desiderio was raised in Palm Beach County in a town called Jupiter, Florida. She attended Suncoast High School where she was enrolled in the International Baccalaureate Program and earned a varsity letter in tennis and cheerleading. Wanting to stay close to home, Nicole attended Florida International University in Miami where she completed a double major in finance and marketing. Now in real estate, she plans to use her finance and marketing expertise in order to navigate through the South Florida market.